Onyx has released the first single screen smartphone that uses the same type of e-Ink technology found on your Kindle or Kobo. This would allow for a glare free experience while using it in direct sunlight and provides longer battery life than the iPhone. The overall design of the phone is small and lightweight, primarily due to the Mobius screen technology that both Sony and e-Ink co-developed. This gives you higher resolution and a thinner display panel. Is the Onyx InkPhone merely a gimmick or does it offer us a glimpse of the future of smartphones? The Onyx InkPhone features a 4.3 inch screen that uses e-Ink instead of the standard LCD, LED or AMOLED found in most mainstream devices. The core display technology is e-Ink Mobius, which was co-developed by Sony. The essence of this screen is to provide a more lightweight panel, higher resolution and faster page turns. 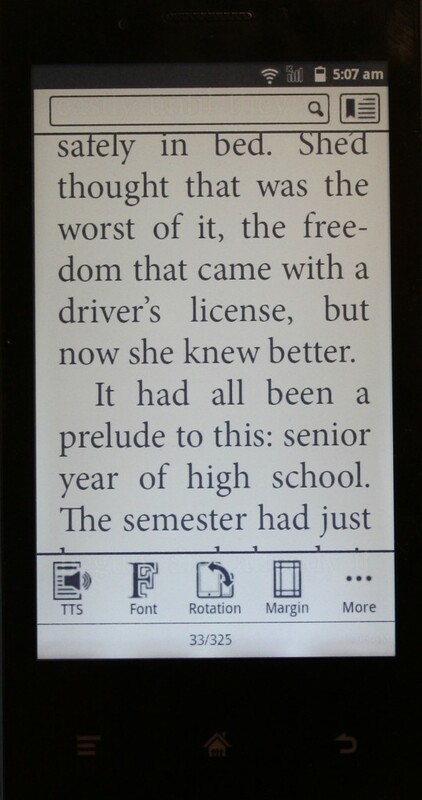 Unlike most e-readers the InkPhone has a capacitive touchscreen and the display panel is flush with the bezel. If you have ever used a Tolino Vision or Kobo Aura you would know it is much easier to interact with the screen in this manner. This phone allows you to read in the dark via the front-lit display. The main difference between this and your iPhone is the light emits from the bottom of the bezel and splashes evenly across the screen. The iPhone and all other phones on the market have light that is emitting from behind the screen, into your eyes. The hardware specs are fairly woeful which provide an abysmally slow experience in navigation, menus and anything that involves typing. 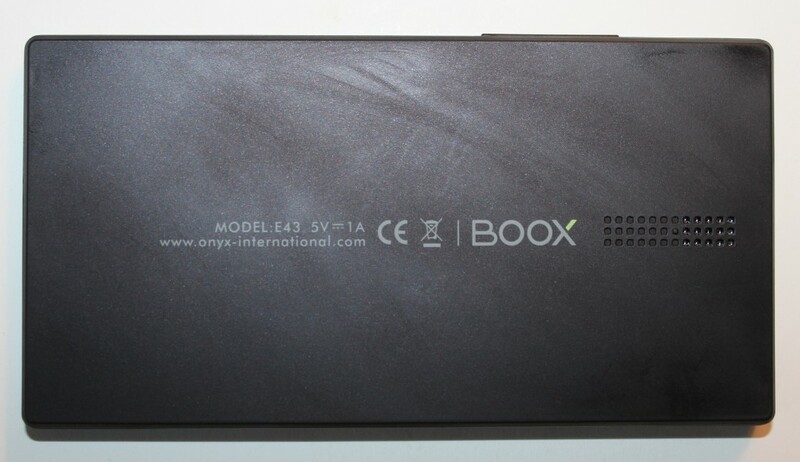 It has a single core Mediatek MT6515M Cortex A9 1.0 GHz processor, 512 MB of RAM and 512MB of storage space. I installed Google Maps, Kindle, Viz Manga, Digg, Facebook and Twitter and already maxed out on available memory. This resulted in the unit being placed in a standby mode and would not boot up until I pulled the battery and put it back in. There is a built in mono speaker and a 3.55 headphone jack built into the phone. The audio is fairly woeful and does not give you a wide array of peaks. When you plug in a set of headphones the sound is equally terrible. I think it comes down to the built in audio system being very dated. People who dig taking selfies will be irked by the fact there is no camera. This will obviously prevent most apps that take advantage of camera being unable to work. One of the redeeming factors is that you should garner 2 weeks of battery life with ultra light use. 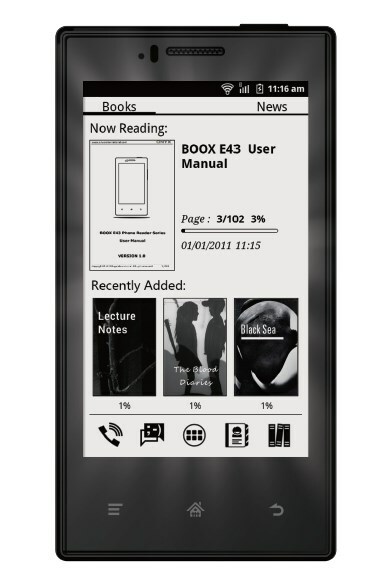 An e-Ink phone on paper sounds like the natural evolution of the technology that originated from dedicated e-readers. In execution however the 512 MB of RAM and 512MB of storage is not enough to give users a robust experience. However, you can put a MicroSD card to enhance it, but most apps do not give the option to install to the SD. 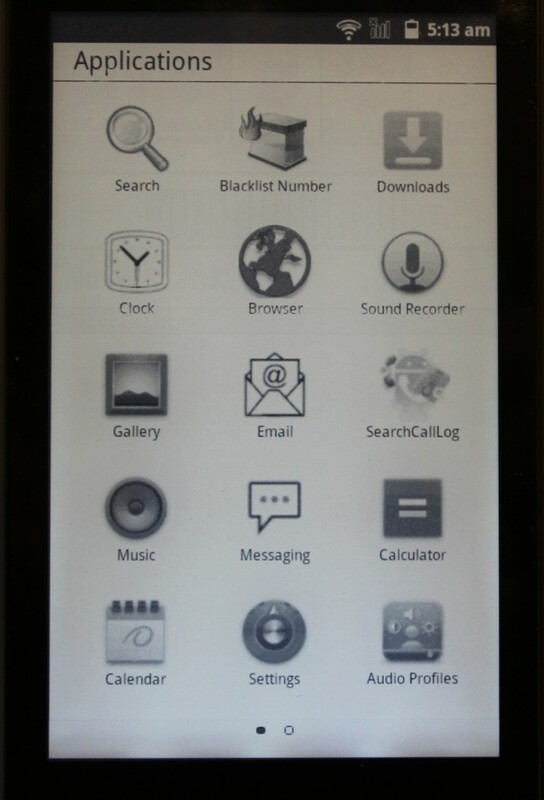 The InkPhone is running Android 2.3 and has a customized homescreen aimed at readers. 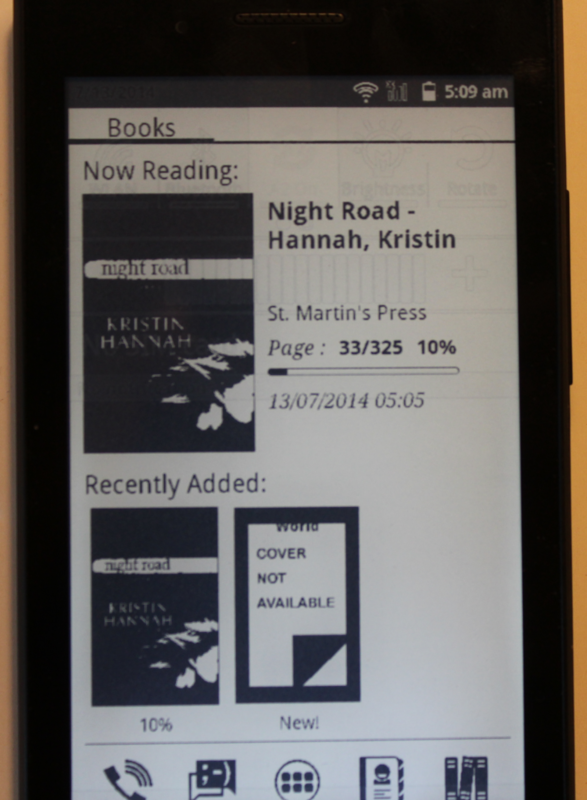 It shows the last few books you have opened up or loaded on the device via the Mini USB cable. When you hit the home button you hit the vanilla Android experience with all of the preinstalled icons and all the apps you install. An older version of the Google Play store is loaded on the phone, giving users the option to install content that is compatible with an older version of Android. Sadly, many of the apps we installed simply won’t work. There seems to be a problem with GPS which makes turn by turn apps unviable. Even things like Google Maps or Street View fail to work. Also, any apps that rely on animations will not work effectively either. Most apps are designed for smartphones and tablets that have solid specs. Developers often add in animated page turns, peaking what’s on the next page or use visual enhancements to flair up the overall design. They are also designed to show off color, since modern tablets can easily handle millions of them. By default the InkPhone does not allow you to move icons from the apps category to your home page. You cannot hold your finger down on an app and have any options to make a shortcut or move it around. Everything is mostly locked into position. You can install a 3rd party Launcher, but most of them do not support an older version of Android because of integration of Google Now and cameras. Scrolling to your various menus, accessing settings or opening apps is an exercise in patience. It took me over 30 seconds to type in your standard 10 digit phone number, because you cannot quickly type. You have to enter a digit, pause, enter it again and so on. This makes text messaging via Whatsapp or entering a WIFI password as a tedious endeavor. Primary any kind of data entry is hindered by the e-Ink screen, which simply isn’t as responsive as any smartphone made in the last ten years. You can increase the speed in which you can enter data, open apps or access your menu by a feature called A2. By default it is turned on and gives you high resolution. If you turn it off, all of the graphics are scaled down by 90% which makes everything pixelated and off-putting. Things tend to be more responsive in this manner, but it is a absolutely huge trade off. The Onyx phone simply does not really allow you to run any type of apps that take advantage of GPS or involved in animations. Kindle, Kobo, Digg, Wattpad, Marvel Comics, Manga Box and all others provide a lackluster experience. Once you turn a page you have wait over seven seconds for it to occur. During this time it the page slowly turns, each frame being visible and severely discombobulating. If you are buying this phone to act as an e-reader you can install certain apps that allow you disable animations or do not have any to begin with. Aldiko, Moon+ Reader and Cool-er are three examples of apps that work really well. The InkPhone has a stock reader app that allows you to turn pages by hitting the volume up and down button and also swipe via the touchscreen. It gives you many cool options to change the font type, line spacing , margins and font size. This app is really responsive and recommended to read PDF files and EPUBS. The one drawback of the built in e-reading app is the Text to Speech function. It simply does not work and is in a broken state. When you initialize it it highlights random bodies of text from page to page, not going in any particular order. It might scan the 1st and last paragraph of page one and do something completely different in subsequent ones. It also goes without saying that despite the fact it looks like it is working there is no audio. Finally, there are dictionaries and translations you can download, but most of them are 150 to 240MB in size which almost takes up the 512MB of internal storage it has. Onyx first unveiled this phone at SID Display Week 2013 in Vancouver BC. The first demo model had a very touch friendly UI and everything was super quick and responsive. I absolutely could not wait until they had a commcerially viable model and when news broke that it was to have Google Play, I was going to abandon by Blackberry and iPhone and just go with e-Ink. Sadly, this phone is woefully inept in its current form and provides too many barriers for wide customer adoption. People want a responsive phone with lots of customization options and very high hardware specs. People want to shoot video, take pictures, install apps and have good audio. The Onyx provides none of this and should be avoided at all costs, unless you are an early adopter or have a penichet for pain. 512MB of internal storage, kill me now. Thanks for the honest and informative review. What a disappointent… Given the reasonable price and my attraction to unusual gadgets, I thought I may buy one for the holidays when there is a lot of sun and never enough electricity. I thought I would keep it in my bag for those times when my S4 doesn’t make it through the day. But this… I admire Onyx for being a pioneer, but I can’t understand why they decided to combine such underpowered hardware with obsolete software? It’s a small market, and I fear it will get even smaller as a result of this device. Probably it would be easier for an experienced manufacturer of mobile phones to set up a version with eink display than for an ebook manufacturer to produce a smartphone. Speed and versatiliy: It would not help if the product would handle any software but require almost as much power as any smartphones with more recent software. For comparison, Facebook did exist a few years ago and there will be software that is less demanding, at least on older smartphones. Camera: You may buy a smartwatch with a camera of prefer a “real” camera with better characteristics over a Smartphone. Microphone: How is the sound quality when speaking? When entering a new market, it would be reasonable for brand creation to take any attention to quality. Why no complaint about the Screen Resolution 600*800? 289,99 $ at shopreaders on July 24, 2014. Almost twice the “official” european price, if considering value added taxes. What a shame. Just a average phone with eink display would be great. The best I can do for now is rooted Nook and separate phone. Sad enough, on the official distributor’s Website, it is still listed as “out of stock” for 149 Euro in Feb. 2015.